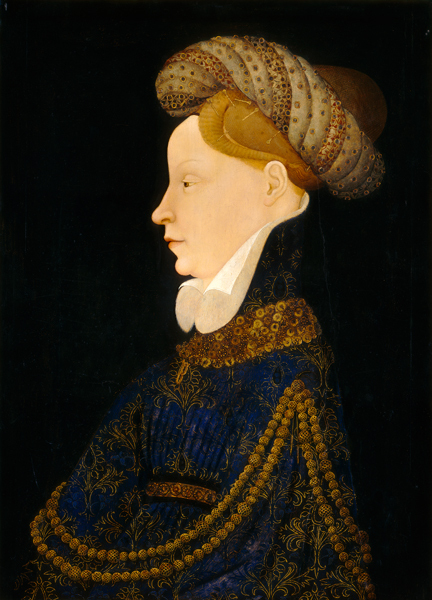 Portraiture took on an important role in forging alliances between powerful Renaissance families. Portraits not only marked and celebrated engagements or nuptials, but they also helped make them possible. 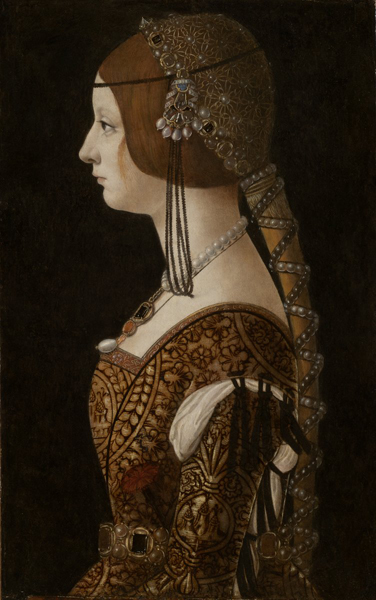 Probably painted around the time of her betrothal, this portrait depicts Bianca Maria Sforza (1472–1510), niece of the duke of Milan, Ludovico Sforza, called Il Moro. A carnation, a flower associated with marriage, is tucked into her heavily jeweled belt, which alludes to her virginity. Probably commissioned by her future husband, Maximilian I, the Holy Roman Emperor, the portrait, like the marriage, served the purposes of both families. Bianca’s uncle needed a prestigious alliance to legitimize his authority as duke. 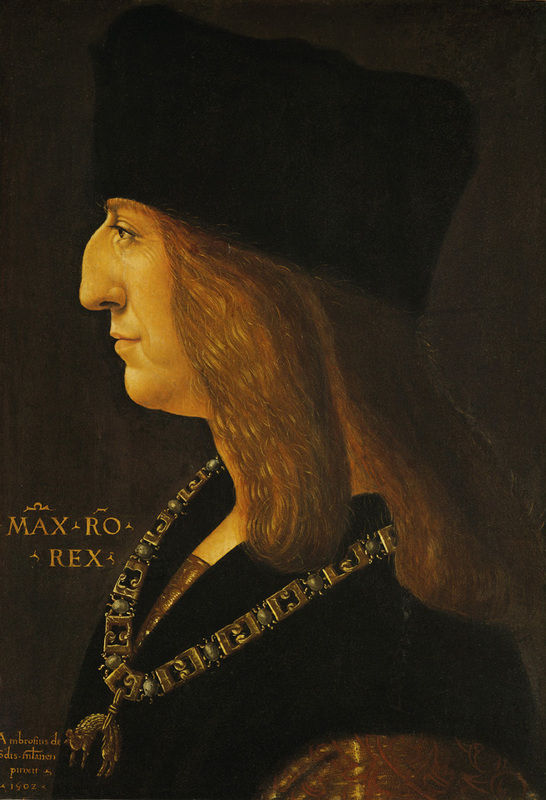 He had usurped the title from Bianca’s younger brother after the assassination of her father, Duke Galeazzo Maria Sforza. 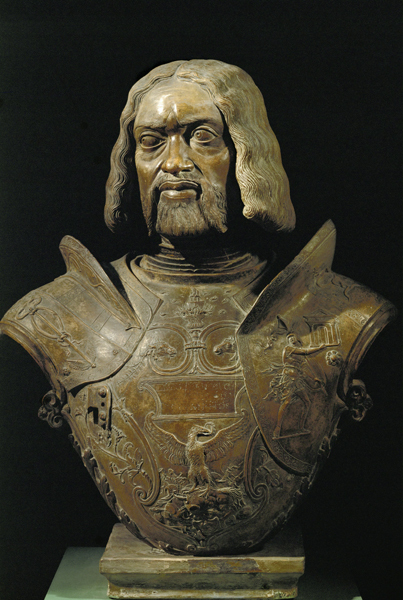 In exchange for investing Ludovico as duke, Maximilian received Bianca’s generous dowry. This tiny medal was cast from an impression taken from a hardstone carving, probably a cameo. Bianca did not meet her new husband until seven months after they had been married by proxy in a great celebration in 1493. Maximilian formally invested Ludovico the next year. An envoy had acquired a drawing of Bianca from Ambrogio de Predis, the court artist in Milan, and later a painted portrait—perhaps this one. It would have let the emperor assess the potential bride’s beauty and suitability. 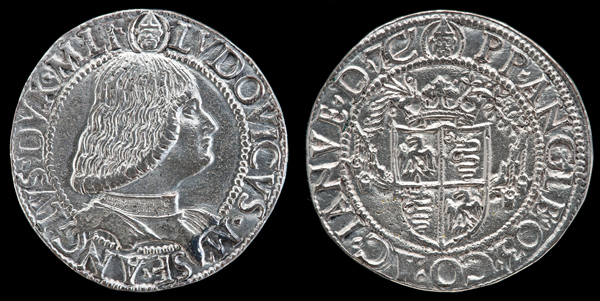 It also made a conspicuous display of Sforza wealth. The headdress, painted with deliberate care, was alone valued at 600 ducats. It is in the form of a small brush (scopetta), one of the Sforza family emblems. Brushes also appear in the brocade patterns of Bianca’s dress.The sitter’s profile pose admits little about her as a person. In Venice and Florence, profile portraits were already somewhat old-fashioned by this date. Merchant patrons preferred a more informative three-quarter pose and, often, a landscape background that placed them as “men of the world.” The profile against a flat background remained in favor in aristocratic cities, however, because its reserve emphasized the sitter’s status. This portrait hung in the ground floor bedroom of Lorenzo de’ Medici, near another portrait of the famed condottiere Federigo da Montefeltro of Urbino (discussed later). It was probably made in association with the visit of Galeazzo to Florence, which was an important acknowledgment of Medici power. An eyewitness described Galeazzo entering on horseback “dressed in blue brocade with lilies, in the manner of the French device and arms.”2 Though turned from full profile, the duke retains aristocratic hauteur, reinforced by the elegantly gloved hand poised in a gesture that is at once mannered and nonchalant. When Bianca Maria Sforza married Maximilian at age twenty-one, she was older than most brides and already a widow. The subject of this portrait is still a boy. An inscription identifies him as FRANC MAR M IIII (Francesco, fourth marquis of Mantua). 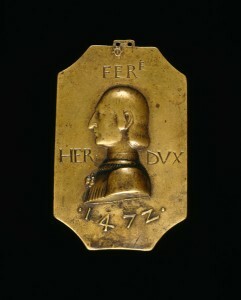 The inscription, however, was probably applied after the portrait was made. Francesco did not assume the title of marquis until 1484, when he was eighteen years old, some years older than this boy appears to be. Could he be as old as fourteen? If so, it is likely that this is one of a pair of portraits that Francesco exchanged with Isabella d’Este (discussed later) when they were betrothed in April 1480. The portraitist had a stronger than usual connection to the family: he was probably an illegitimate son (one of many) of the bride’s grandfather, Niccolo III of Ferrara. Baldassare d’Este had worked previously at the Sforza court in Milan, apparently primarily as a portraitist; he also made medals, including one of Ercole d’Este, the bride’s father. 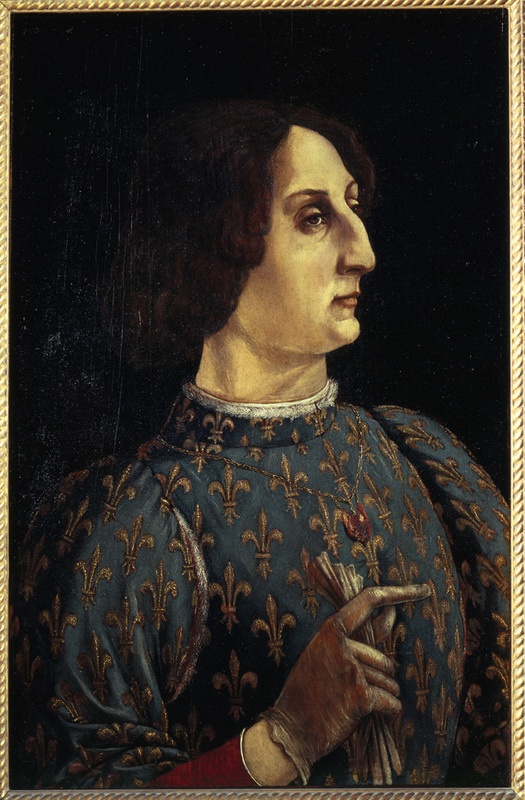 Galeazzo Maria Sforza recommended him to the court in Ferrara as “a suitable and respectable kind of person and also because he is good at his craft.”3 The correspondence between the Este and Sforza was not only a recommendation. Court artists were not free agents, and arrangements had to be made with their employers if they were to work for other patrons. The abbreviated inscription here names Ercole (HER) as duke (DVX) in Ferrara and gives the date of 1472. The medal was most likely made to commemorate his investiture as duke by the pope, which resolved a dispute between Ercole and his nephew Niccolò, who had claimed the title and attempted a coup d’etat. During the crisis, Ercole’s wife, Eleanora of Aragon, responded with energetic resolve (discussed later). The rich costume and jewels of this unknown woman, like the formal but decorative style of her portrait, suggest she must have been of fairly high rank in the French court. Francesco’s likeness well illustrates what aristocratic patrons from the north Italian courts sought in a portrait. It conveys rank in many ways. Most obvious are the sumptuous necklace and pendant studded with gems and pearls; sumptuary laws often prohibited the wearing of such luxury items by non-aristocrats, even very rich members of the merchant class. More subtle are clues in the style of the painting and the way the sitter is portrayed. The image’s refined elegance echoes the international Gothic style favored at the French court. 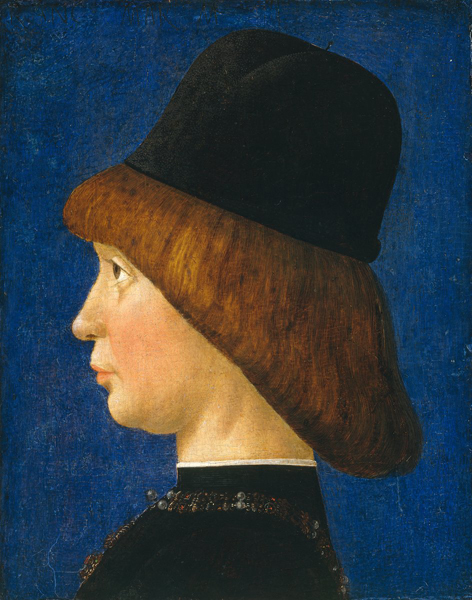 The boy’s head, coif, and cap are traced with a calligraphic line against a brilliant background, and his expressionless profile imparts the reserve that was essential to aristocratic demeanor. Nonetheless, Baldassare seems also to have shown sympathy for his young subject, even if he was perhaps emphasizing the positive in an image destined for the eyes of a future spouse. 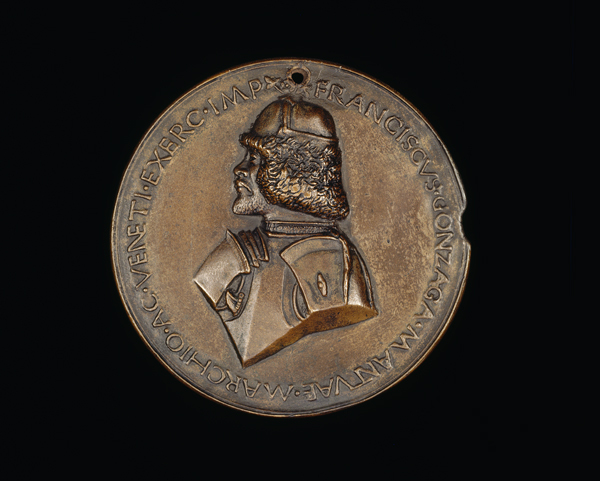 Later portraits of Francesco, whether drawn, painted, or sculpted, show that he had a large and protuberant forehead, well disguised in the portrait medal by a fringe of full bangs.